Getting a college education isn’t cheap. Tuition prices skyrocketed between 1997 and 2017, jumping an incredible 237 percent at in-state public universities. Many families lack the savings to cover even a $1,000 emergency, let alone the $40,000 or more needed for an undergraduate degree. If you want to help your children go to college but can’t pay for it yourself, you might feel discouraged or unsure about what to do next. However, you can still help your kids get money for college without breaking the bank. It’s never too early to start saving for college. Before you know it, your precious little one will be applying to universities. Help them prepare by setting up a 529 college savings plan in your name, even if you can only invest $20 a week. These state-sponsored plans offer tax advantages and compounding interest. If you’re worried you can’t save enough or it’s too late to get started, don’t let that stop you. Which is better: $1,000 saved for college, or nothing? No, we’re not talking about the latest Beyoncé album. Teach your child about saving money by using part of your gift-buying budget to get them a certificate of deposit. CDs start at just $500, with interest rates averaging between one to three percent. Look into CD laddering and step-rate CDs to maximize your investment. Ask your family and friends to consider contributing to your child’s college savings instead of buying expensive gifts. A CD may not be as exciting as a new video game or toy, but your child will be glad to have that money when they are in college. As soon as your child is eligible, be sure to fill out the Free Application for Federal Student Aid. Nearly every student qualifies for federal financial aid from free Pell Grants, subsidized or unsubsidized student loans, and work-study programs. Don’t leave money on the table by missing the FAFSA deadline. Additionally, you should research financial aid offered directly by colleges to see which of your child’s top picks are the most generous with their own scholarships, grants, and loans. Even if you’re approved for a Stafford, Perkins, or Parent PLUS federal loan, make sure you also investigate and compare private student loans. Many banks and credit unions offer private loans for school, which can take the place of a federal loan or supplement one if you need more money. With good credit, private loan interest rates and terms will often be better than a federal loan. You can also help your child build credit by co-signing their own private student loan. 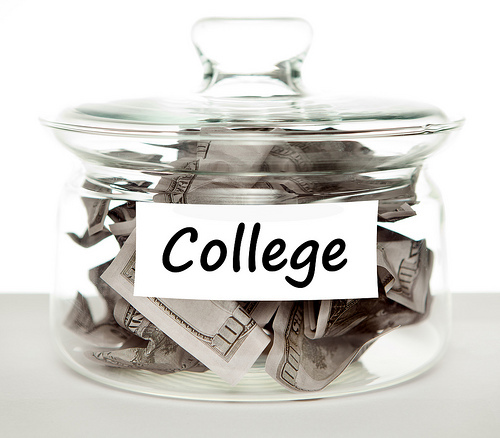 Paying for college can be stressful, but don’t let fear or guilt keep you from making a plan. Have an honest conversation with your child about college expenses, find out what their goals are, and work together to decide the best way to reach those goals. By sharing the burden and responsibility, you can help your kids pay for college and save your sanity.